Coming at the end of the month to the Osa southern region of Costa Rica, the ninth Festival of the Stone Spheres celebrates one of the most enigmatic historical and cultural mysteries of Costa Rica. The 2014 Festival of the Spheres will be held March 26 to 30 in Palmar Sur, Palmar Norte and Sierpe. Put on by the National Museum of Costa Rica, the majority of the activities will be at its new satellite Museum of the Stone Spheres at Finca 6 in Palmar Sur, where research on the countryâ€™s spheres is centered. 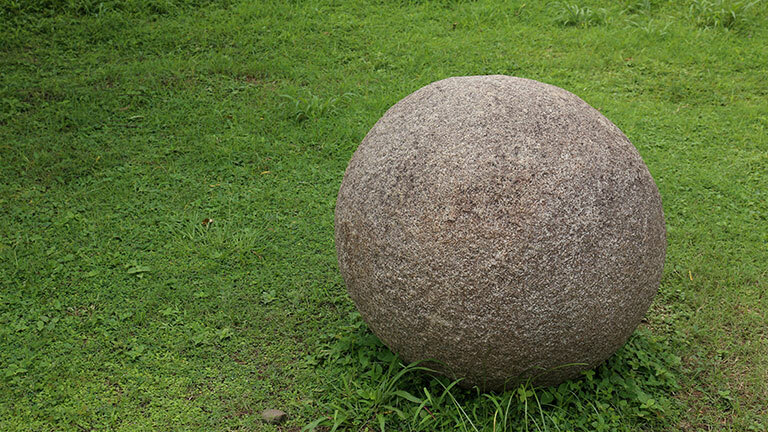 The giant, perfectly-formed spheres of granite-like igneous rock were discovered in southern Costa Rica. Their origin, exact age and history are still a mystery, though archaeologists tentatively date the spheres to 400 to 1500 A.D. Man-made by an indigenous people who disappeared long ago and left no written records, the spheres have sparked international attention as to their origin and purpose. It is suspected that they were used to represent astronomical constellations, for delineation of tribal areas, or served as a place of worship and gathering. They were declared a UNESCO World Heritage in early 2014. Around 300 spheres have been found in the DiquÃ­s Delta region in the south Pacific of Costa Rica, near the TÃ©rraba River and the cities of Puerto CortÃ©s, Palmar Norte and Sierpe. The almost perfectly spherical stones range in diameter from a few centimeters up to 2.5 meters, with the largest weighing 16 tons. They were discovered in the early 1930s during the clearing of jungle for banana plantations. One of the many unanswered questions is how the native peoples transported a 16-ton ball made of a rock that exists 50 miles away from where the spheres were found in the jungle. The Festival of the Stone Spheres will combine cultural and artistic performances, environmental themes, concerts, craft fairs, and educational and sports activities. Shows will be put on by indigenous local Borucas, whose ancestors are credited with having made the spheres. A 47 km mountain bike recreational race will follow historic routes through some pre-Columbian communities and former banana plantations. There also will be an 8 km foot race. Attend the Festival of the Stone Spheres on your way to or from Playa Nicuesa Rainforest Lodge on Golfo Dulce. The remote oceanfront jungle property is a unique and exotic Costa Rica eco-lodge on a 165-acre private reserve across from the Osa Peninsula.